The Prisma client is generated from your datamodel. Its API exposes CRUD and other operations for the models defined in the datamodel. Whenever a database record is queried using the Prisma client, all scalar fields of that record are fetched. This is true no matter if a single record or a list of records is queried. In this case, the returned user record will have four properties (that correspond to the scalar fields of the User model): id, name, email and role. The posts and comments fields are both relation fields and are therefore not included in the response. Similar to the previous request, each object inside the users array only has the scalar and no relation fields. For each model in your datamodel, there is a method generated in the Prisma client API that allows to fetch single records of that model. The where input argument for these methods is an object that has as properties all unique fields of the model. This means, for all three methods, the id field is accepted (as the corresponding models each have an id field annotated as @unique). The input object for the user method additionaly has an email field. For each model in your datamodel, there is a method generated in the Prisma client API that allows to fetch a list of the respective records. Prisma client has a fluent API to query relations in your database. Meaning you can simply chain your method calls to navigate the relation properties of the returned records. In this example, users() already returns a list, so it's not possible to query the posts relation of each user record inside the list. If you're building a GraphQL server and are not sure how to implement your resolvers to resolve the relations in your GraphQL schema, check out this tutorial. 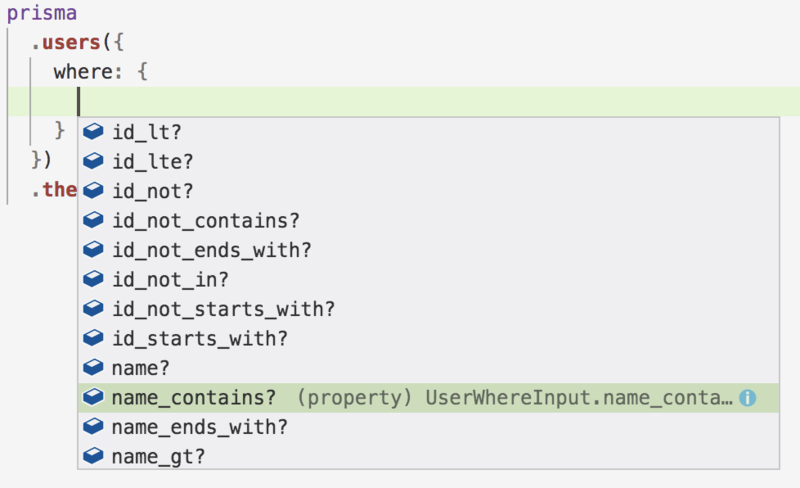 Instead of querying all scalar fields of a record (which is the default behavior), you can specify which fields you'd like retrieve by using the $fragment API. This is useful to exclude large unneeded fields (like BLOB values or huge strings). It also lets you fetch arbitrary relations. The next version of the Prisma client API will have an improved and type-safe API to select fields. Find more info here. Basic filters let you specify certain criteria to constrain which records should be returned in a list. The filters are specified in the where object of the input argument which is accepted by any list query. The type of the where object depends on the model for which it was generated. It is also possible to combine multiple filters using the AND and OR fields. Dates and times in the Prisma client API follow the ISO 8601 standard which generally is of the form: YYYY-MM-DDThh:mm:ss. Learn more. Relational filters can be used to constrain the returned records on a relation list field. The types used for filtering are identical to basic filters, the only difference is that the filters are not applied on the root level of the method call but when querying a relation (via the fluent API) on a later level. When querying a list of records, you can order (sort) the list by any scalar field of that model. Each generated method to query a list of records therefore accepts the orderBy field on its input object. The type of the orderBy field depends on the scalar fields of the model for which it was generated. Note that you can always order by createdAt and updatedAt, even when the fields have not been added to your models. When querying a list of records, you can fetch certain parts (i.e. pages) of that list by supplying pagination arguments. To seek forward, use first; specify the id of a starting record with after. To seek backward, use last; specify the id of a starting record with before. You cannot combine first with before or last with after. If you do so, before/after will simply be ignored and only first or last is actually applied (at the very beginning or end of the list, depending on which you're using). Note that you can query for more records than actually exist in the database without an error message. When using first, skip skips records at the beginning of the list. When using last, skip skips records from the end of the list. avg (coming soon): Computes the average of a list of numbers. median (coming soon): Computes the median of a list of numbers. max (coming soon): Returns the greatest element of a list of numbers. min (coming soon): Returns the smallest element of a list of numbers. sum (coming soon): Computes the sum of a list of numbers. See this GitHub issue to learn more about the upcoming aggregation functions. As the GraphQL operation is passed untyped (as a regular string), the type of the returned promise is any.